The hydraulic longline hauler TY’HALEUR is the newest product adapted for smaller boats (6 à 9 meter long). It retrieves the main line of pelagic or demersal longlines. 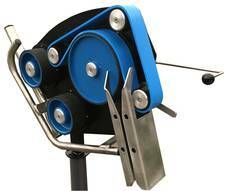 The hauler works with all longline types: monofilament or ropes (Ø1mm to Ø10mm). A system of pressure band holds the main line of the longline. When hauling, the longline is not twisted or turned and it falls neatly in the FILEHOOK longline storage tub. This hauler has been developed to improve the safety and working conditions of fishermen. The on/off handle is easily accessible from all sides.